The bond market agrees with the macro data. 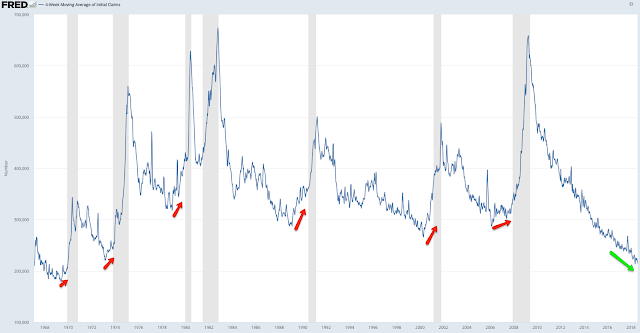 The yield curve has 'inverted' (10 year yields less than 2-year yields) ahead of every recession in the past 40 years (arrows). 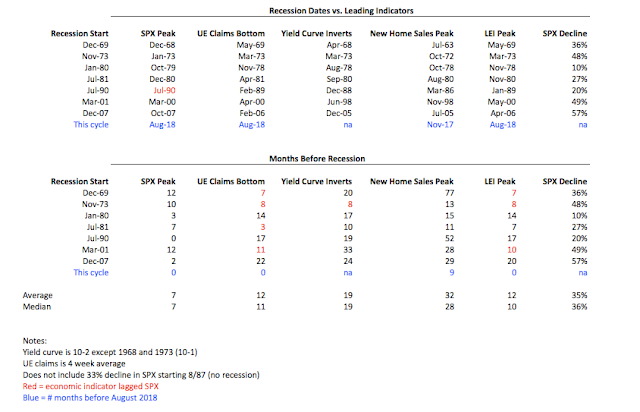 The lag between inversion and the start of the next recession has been long: at least 10 months and in several instances as long as 2-3 years. On this basis, the current expansion will likely last into mid-2019 at a minimum. Enlarge any image by clicking on it. Unemployment claims are also in a declining trend, reaching a new 49 year low this month. Historically, claims have started to rise at least 7 months ahead of the next recession. New home sales made a new 10 year high in November and were only marginally lower in July. In the past 50 years, at least 11 months has lapsed between the expansion's high print in new home sales and the start of the next recession. Real retail sales made a new all-time high (ATH) in July. The trend higher is strong, in comparison to the period prior to the past two recessions. 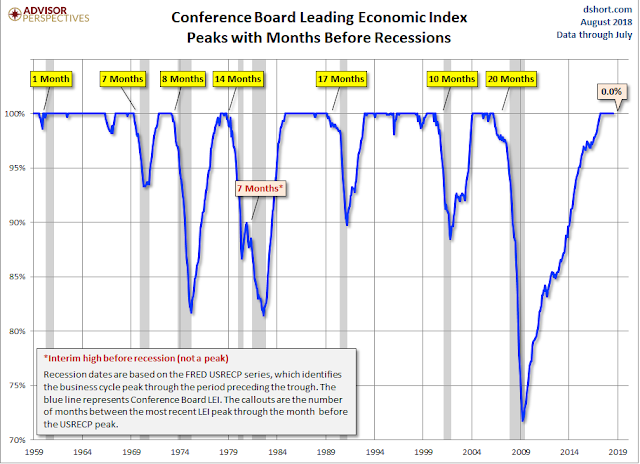 The Conference Board's Leading Economic Indicator (LEI) Index reached a new uptrend high in July. This index includes the indicators above plus equity prices, ISM new orders, manufacturing hours and consumer confidence. This index can fluctuate during an expansion but the final peak has been at least 7 months before the next recession in the past 50 years (from Doug Short). 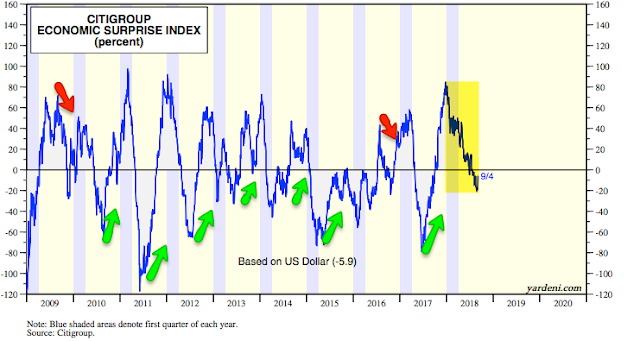 Equity prices typically fall ahead of the next recession, but the macro indictors highlighted above weaken even earlier and help distinguish a 10% correction from an oncoming bear market. 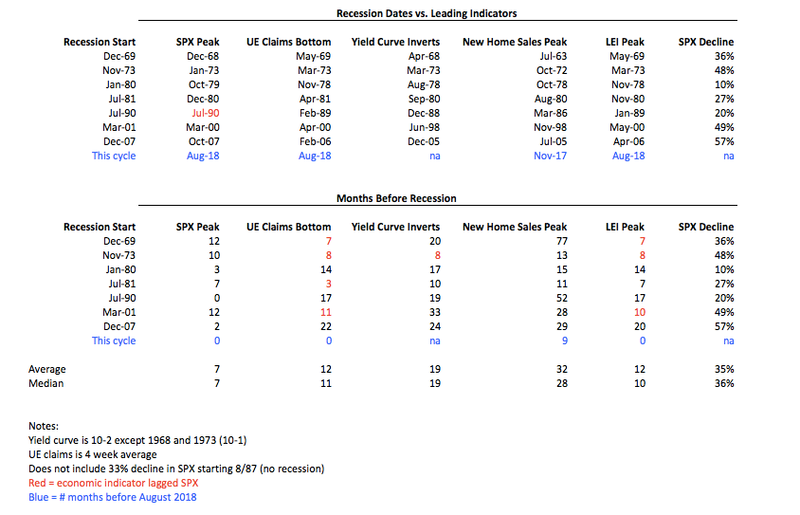 On balance, these indicators are not hinting at an imminent recession; new home sales is the only potential warning flag (its most recent peak was 9 months ago) but it has the longest lead time to the next recession of all the indicators (a recent post on this is here). Employment: Monthly employment gains have averaged 194,000 during the past year, with annual growth of 1.6% yoy. Employment has been been driven by full-time jobs, which rose to a new all-time high in July. Compensation: Compensation growth is on an improving trend. Hourly wage growth was 2.9% yoy in August, while the 2Q18 employment cost index grew 2.9% yoy, the highest growth in the past 10 years. Demand: Real demand growth has been 2-3%. In July, real personal consumption growth was 2.8%. Real retail sales grew 3.4% yoy in July, making a new ATH. 2Q18 GDP growth was 2.9%, the highest in nearly 3 years. Housing: New home sales grew 13% yoy in July. Housing starts were at the highest level of the past 11 years in May, but fell 1% yoy in July. Multi-family units remain a drag on overall development. Manufacturing: Core durable goods rose 8.6% yoy in July. The manufacturing component of industrial production grew 2.2% yoy in July. Both measures were at the highest level in 10 years in July. By far, the largest risk to the economy is the escalation in trade war rhetoric, which reduces global demand, raises prices and eventually leads to lower investment. 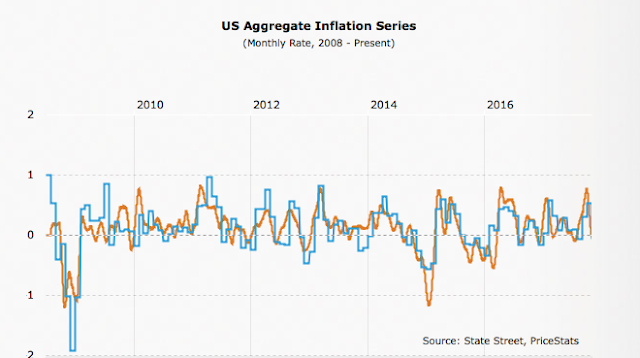 The macro data is fine; this is a possible wild card (from St Louis Fed). The August non-farm payroll was 201,000 new employees minus 50,000 in revisions for the prior two months. Employment growth has been decelerating. The average monthly gain in employment was 240,000 in 2015, 211,000 in 2016 and 190,000 in 2017. In the past 12 months, the monthly average has been 194,000. For this reason, it's better to look at the trend; in August, trend employment growth was 1.6% yoy. Until spring 2016, annual growth had been over 2%, the highest since the 1990s. Ahead of a recession, employment growth normally falls (arrows). Continued deceleration in employment growth in the coming months continues to be an important watch out. Employment has been been driven by full-time jobs, which rose to a new all-time high in July (blue line), not part-time jobs (red line). 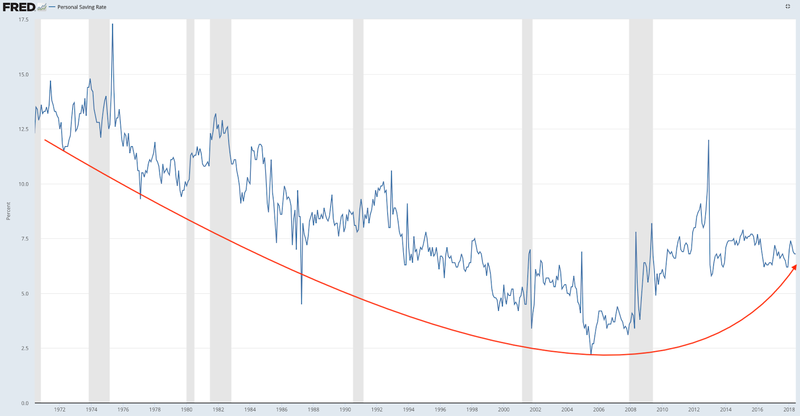 The labor force participation rate (the percentage of the population over 16 that is either working or looking for work) has recently stabilized. The participation rate had been falling since 2001 as baby boomers retire, exactly as participation started to rise in the mid-1960s as this demographic group entered the workforce. Another driver is women, whose participation rate increased from about 30% in the 1950s to a peak of 60% in 1999, and younger adults staying in school (and thus out of the work force) longer. The prime working age (25 to 54 year olds) labor force participation rate stands at 82%, down only slightly from its peak in 2000 at 84%, and much higher than anytime prior to the 1980s. Average hourly earnings growth was 2.9% yoy in August. This is a positive trend, showing demand for more workers. Sustained acceleration in wages would be a big positive for consumption and investment that would further fuel employment. Similarly, 2Q18 employment cost index shows total compensation growth was 2.9% yoy, the highest in the past 10 years. Real (inflation adjusted) GDP growth through 2Q18 was 2.9% yoy, the best growth rate in nearly 3 years. 2.5-5% was common during prior expansionary periods prior to 2006. Stripping out the changes in GDP due to inventory produces "real final sales". This is a better measure of consumption growth than total GDP. In 2Q18, this grew 3.0% yoy. A sustained break above 3% would be noteworthy. The "real personal consumption expenditures" component of GDP (defined), which accounts for about 70% of GDP, grew 2.6% yoy in 2Q18. This is approaching the 3-5% that was common in prior expansionary periods after 1980 and prior to the great recession. 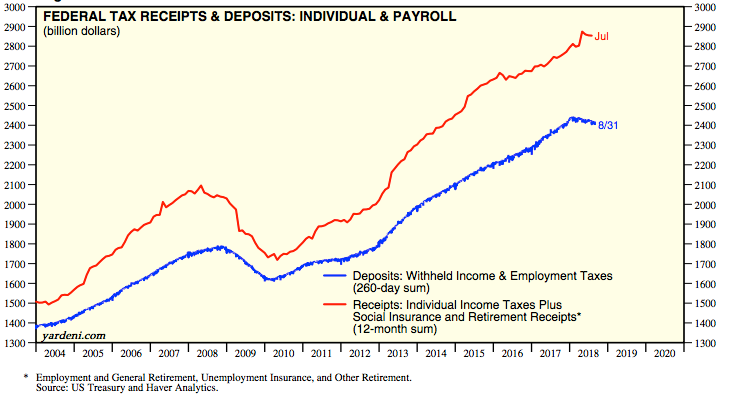 On a monthly basis, the growth in real personal consumption expenditures was 2.8% yoy in July. Real retail sales grew 3.4% yoy in July, making a new ATH. Sales fell yoy more than a year ahead of the last recession. Retail sales in the past three years have been strongly affected by the large fall and rebound in the price of gasoline. In July, real retail sales at gasoline stations grew by 19% yoy after having fallen more than 20% yoy during 2016. Real retail sales excluding gas stations grew 2.2% in July. Core durable goods orders (excluding military, so that it measures consumption, and transportation, which is highly volatile) rose 8.6% yoy (nominal) in July, a 10-year high. Weakness in durable goods has not been a useful predictor of broader economic weakness in the past (arrows). Industrial production (real manufacturing, mining and utility output) growth was 4.2% yoy in July. The more important manufacturing component (excluding mining and oil/gas extraction; red line) rose 3.0% yoy. Total IP was at a new ATH in July; manufacturing IP was at a 10 year high in July. Industrial production is a volatile series, with negative annual growth during parts of 2014 and 2016. Importantly, about 75% of industrial production groups are expanding. A drop below 40% will imply widespread weakness that typically precedes a recession (from Tim Duy). Weakness in total industrial production had been concentrated in the mining sector; the past three years had the worst annual fall in more than 40 years. It is not unusual for this part of industrial production to plummet outside of recessions. With the recovery in oil/gas extraction, mining rose 13% yoy in July. New housing sales grew 13% yoy in July after reaching their highest level in 10 years in November. Housing starts and permits are near a 10 year high although multi-family unit remain relatively weak. Overall levels of construction and sales are small relative to prior bull markets, but the trend is higher. First, new single family houses sold was 627,000 in July; sales in November were the highest of the past 10 years. Growth in July was +13% over the past year after falling -12% yoy in July 2017. YTD, new home sales are tracking +5% growth over 2017. Second, housing starts fell 1% yoy in July. 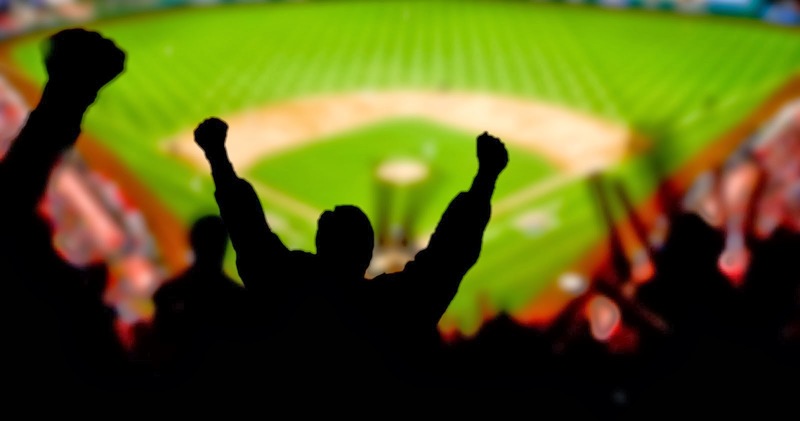 Starts in May were at the highest level of the past 11 years. The cycle high print has typically been well over a year before the next recession (arrows). Building permits rose 4% yoy in July after rising 6% yoy in July 2017. Permits rose to the highest level in 10 years in March (red line). Single family housing starts (blue line) reached a new post-recession high in November and were only marginally lower in May. Meanwhile. multi-unit housing starts (red line) has been flat over the past four years; this has been a drag on overall starts. 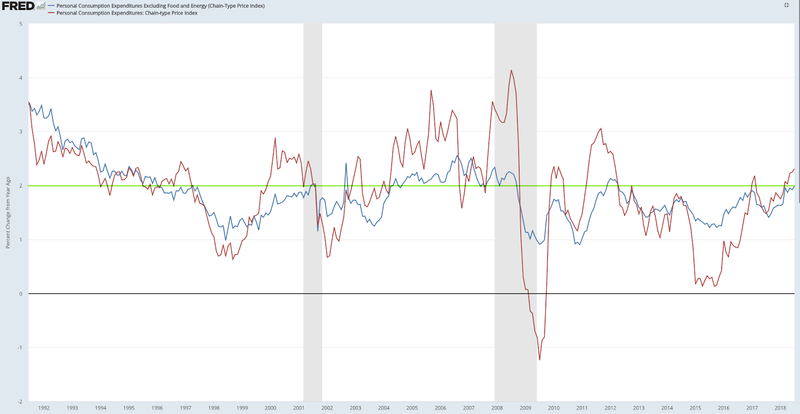 CPI (blue line) was 2.9% last month. The more important core CPI (excluding volatile food and energy; red line) grew 2.3%. Core CPI was at current levels between January 2016 and February 2017 before falling back below 2%. Note that CPI growth was near a low 12 months ago (arrow), meaning the yoy growth will moderate in 2H18 all else being equal. The Fed prefers to use personal consumption expenditures (PCE) to measure inflation; total and core PCE were 2.3% and 2.0% yoy, respectively, last month. In summary, the major macro data so far suggest positive but modest growth. This is consistent with corporate sales growth. SPX sales growth in 2018 is expected to only be about 6-7% (nominal). With the rise in earnings and the moderation in share prices, valuations are now back to their 25 year average. 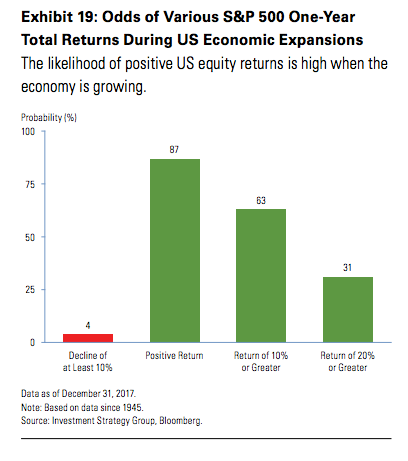 The consensus expects earnings to grow about 18% in 2018 and 10% in 2019. 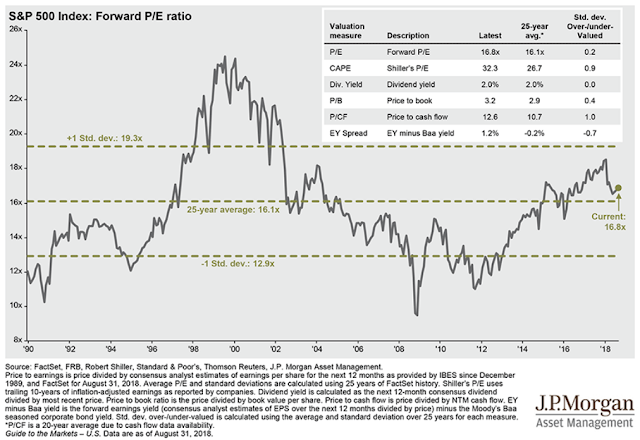 Equity appreciation can therefore be driven by both corporate growth as well as valuation expansion (chart from JPM).